We developed this scholarship to annually recognize and reward two outstanding seniors who have participated in our program and have demonstrated qualities of sportsmanship, leadership & community involvement that are consistent with what our organization represents. These 3 fundamentals of Sportsmanship , Leadership & Community Involvement are the backbone of our organization. Sportsmanship – We aim at not only teaching fundamentals of baseball but also sportsmanship. Good winners and Good losers. Leadership – Volunteers are leaders to kids. Not only do our volunteers lead teams but they also act as role models. How we interact and provide leadership to our children will have a major influence as to whether they will continue with the game. Community involvement – Not only be involved with the community but get the community to be involved with Spencerport Baseball. We must be flexible, provide good communication and seek feedback not only from our constituents, but the town and the schools as well. Sportsmanship – Steve was one of the best managers we ever had. His love of the game was apparent and even though the score of the game was important, his focus was on making sure his players played hard and played like gentlemen. Leadership – When Steve was on the field, the players could not help but not want to go out and play the game. They thought they were learning the game, but Steve was actually teaching them lessons about life. Community Involvement – He spent 30 years with the board while also managing a 13-15 year old Pony team. 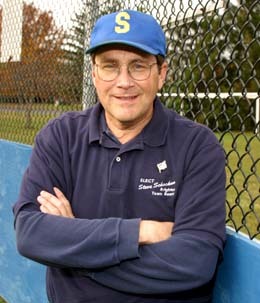 He would always make the commute from Irondequoit for every event and every game.